Aleen Remez A, Onishi A, Menuchin-Lasowski, Biran L, Blackshaw S, Wahlin KJ, Zack DJ, Ashery-Padan R. Pax6 is essential for the generation of late-born retinal neurons and for inhibition of photoreceptor-fate during late stages of retinogenesis. Dev Biol. 2017 Oct 6. pii: S0012-1606(16)30701-1. PMID: 28993200. Vergara, NM., , Flores-Bellver, M., Aparicio-Domingo, S., McNally, M., Wahlin, KJ., Saxena, M., Mumm, J., Canto-Soler, MV. Enabling quantitative screening in retinal organoids: 3D automated reporter quantification technology (3D-ARQ) 2017 Sep 4. pii: dev.146290. doi: 10.1242/dev.146290. Wilson, D.., Routkevitch, D., Mosenia, A., Wahlin, KJ., Zack, DJ., Quinones-Hinojosa, A., Green, J. A Triple-Fluorophore Labeled Nucleic Acid pH Nanosensor to Investigate Non-Viral Gene Delivery. Molecular Therapy. Molecular Therapy. 2017. Foster, J., Wahlin KJ, Adams, S., Birk, D., Zack, DJ., Shakravarkti, S. Cornea organoids from human induced pluripotent stem cells. Scientific Reports 7, Article number: 41286 (2017). Bhise, N*., Wahlin, KJ*., Zack, DJ., Green, J. Evaluating the potential of poly(beta-amino ester) nanoparticles for reprogramming human fibroblasts to induced pluripotent stem cells. Int J. Nanomedicine. 2013.PMCID:PMC3857166. Wahin, K.J., Enke, R., Fuller, JA., Kalesnykas, G., Zack DJ., Merbs, S. Epigenetics and Cell Death: DNA Hypermethylation in Programmed Retinal Cell Death. PLOS1. 2013. PMCID:PMC3823652. Maruotti J., Wahlin KJ., Gorrell, D., Zack DJ. A simple and scalable process for the differentiation of retinal pigment epithelium from human pluripotent stem cells. Stem Cells Translational Medicine. May;2(5):341-54, 2013. PMCID:PMC3667560. Lumayag S, Haldin , CE., Corbett N., Wahlin ,KJ., Cowan C., Turturro S., Larsen P., Kovacs B, Witmer PD., Valle D., Zack DJ., Nicholson DA., Xu. S. Inactivation of the miR-183/96/182 Cluster Results in Syndromic Retinal Degeneration. Proc Natl Acad Sci U S A. 2013 Feb 5;110(6):E507-16. PMCID:PMC3568372. Wahlin, KJ., Hackler, L., Adler, RA, Zack, DJ. Alternative Splicing of Neuroligin and its Protein Distribution in the Outer Plexiform Layer of the Chicken Retina. J Comp Neurol. 2010 Dec 15;518(24):4938-62. 2010. PMCID:PMC4065168. McNally MM, Wahlin KJ., Canto-Soler M. Endogenous expression of ASLV viral proteins in Specific Pathogen Free chicken embryos: relevance for the developmental biology research field. BMC Developmental Biology 18, 10:106. 2010. PMCID: PMC2973938. Engler, C., Kelliher, C., Wahlin, KJ., Speck, CL., Jun AS. Comparison of non-viral methods to genetically modify and enrich populations of primary human corneal endothelial cells. Mol vision15:629-6. 2009 PMCID:PMC2664841. Huang, H., Wahlin, KJ., M. McNally, N.D. Irving, and R. Adler. 2008. Developmental regulation of muscleblind-like (MBNL) gene expression in the chicken embryo retina. Dev Dyn 237:286-296. PMID:18095352. Wahlin,KJ., Adler,R., Zack, DJ., and Campochiaro., PA. 2001. Neurotrophic signaling in normal and degenerating rodent retinas. Experimental eye research 73:693-701.PMID: 11747369. Angiopoietin 2 expression in the retina: upregulation during physiologic and pathologic neovascularization. Hackett, SF., Ozaki, H., Strauss, RW., Wahlin, KJ., Suri, C., Maisonpierre, P., Yancopoulos, G., Campochiaro, PA. Journal of Cellular Physiology 184(3):275 – 284. 2000. PMID:10911358. 1. Wahlin, KJ., Maruotti, J., Zack, DJ. 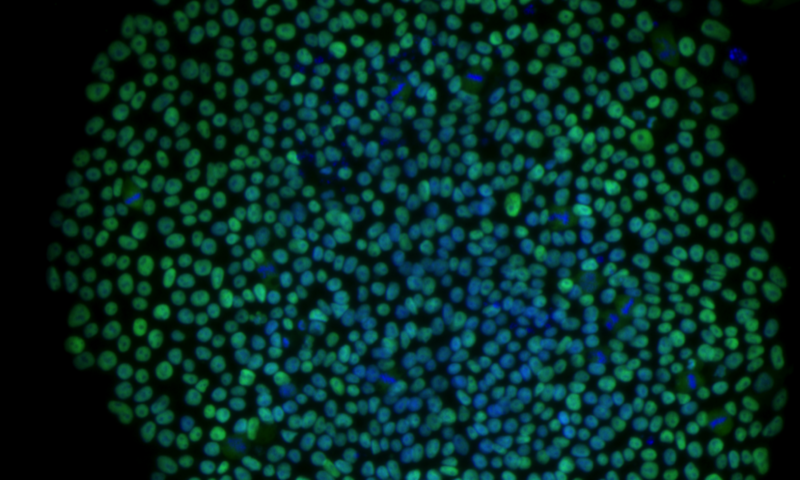 Modeling retinal dystrophies using patient-derived induced pluripotent stem cells. Advances in experimental medicine and biology. 01/2014; 801:157-64.